Progress, though slow, has been very positive which now enables me to re-connect with the things I love doing – the blog being right up there with the work I do. Hopefully this is the beginning of more consistent blogging. Next week some of my original art for THE ROLLING STONES goes up for auction at Bonhams. I thought I’d take the opportunity to provide insight into the processes involved in creating an ident for a rock’n’roll tour organised for such a gigantic corporation as THE ROLLING STONES. This short entry will continue in another couple of weeks with more stories – some hilarious, others nightmarish – but here’s a taster of what’s to come. 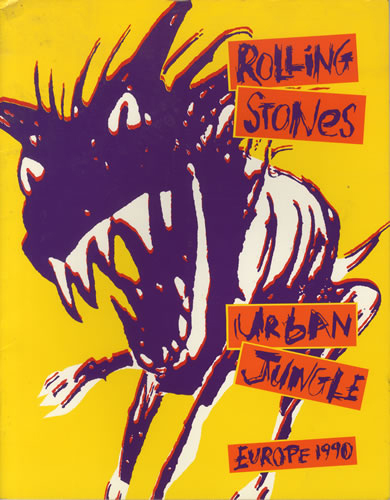 – my affectionate name for the raging rabid dog used as the primary image for THE ROLLING STONES ‘Urban Jungle 1990’ tour. He was found at the bottom of a sketch produced by the stage design team at Mark Fisher and was the perfect beast to front ‘Urban Jungle’. 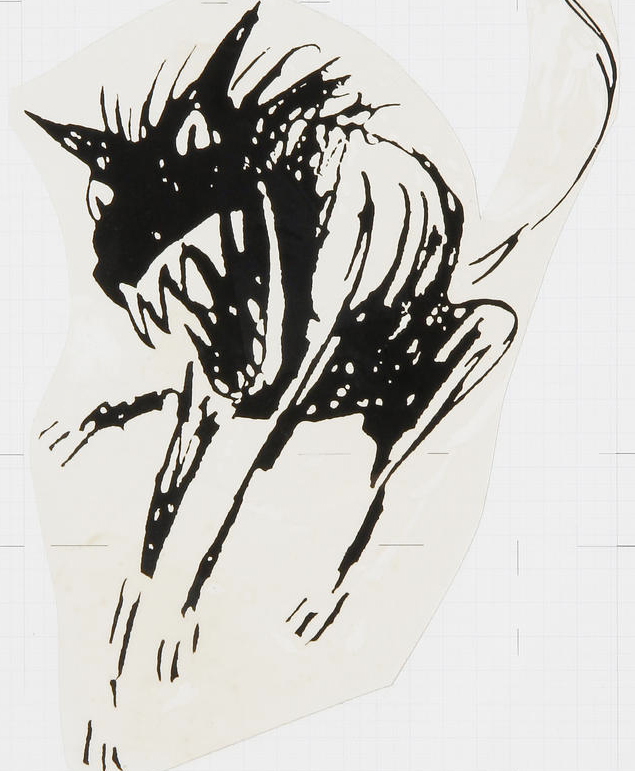 Skippy was redrawn – but in such a way that the rough graffiti feel was exaggerated. Vibrant colours were added, a drop-shadow created to give more weight and depth to the image, the head was made bigger to increase Skippy’s aggression and complementary typography was designed and approved. Skippy was now ready to rampage around Europe ! Too often graphic images can be overworked, considered too much and compromised, (see earlier Def Leppard story on the design of ‘HYSTERIA’ cover), and it shows! ‘Skippy’ is the perfect example of how an almost throw-away original image can be developed and retain its free-flowing rough style, its authenticity and its vibrant energy. It was the antithesis of the `STEEL WHEELS’ design but perfectly suited to the demands of a European mentality. Once the image, colours and the typestyle had been approved the tour could then be styled throughout. From a graphic point of view I always began (remember this is still early computer days for creating artwork of any decent quality) with a Master Art Board. For those of you interested in how this looks click HERE. This Master was then used to create the tour programme, merchandising, posters and promotional items. More on this in the next blog. I know it cost several hundred thousand pounds to create the WORKING MODEL for the (approved) staging. God knows what it would cost if they had to change it. What happened?